Like Death Valley National Park, our favorite national park, Petrified Forest National Park blew us away with its unexpected beauty. From striped rolling hills and rugged rock formations, to multi-hued eroding cliffs and rainbow petrified wood, we were once again in awe of the beautiful desert landscape. Our second day in the park was a full day and it started at the Painted Desert Visitor Center in the Painted Desert Community Complex. Also nearby, you’ll find Tawa Trail, which leads 1.2 miles from the entrance station through tranquil grasslands to Tawa Point and connects with the Painted Desert Rim Trail. 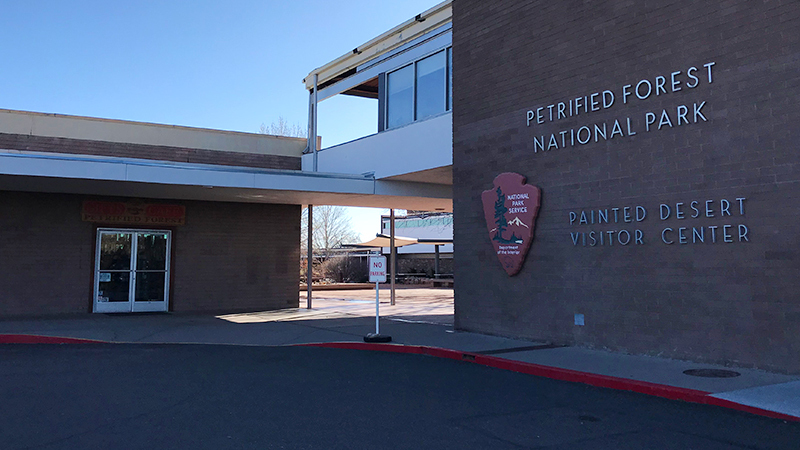 The Painted Desert Visitor Center at Petrified Forest National Park is located at 1 Park Road #2217, Petrified Forest, Arizona 86028 in both Apache County. Tawa Trail leads 1.2 miles from the entrance station through tranquil grasslands to Tawa Point and connects with the Painted Desert Rim Trail. Petrified Forest was designated a National Monument in 1906 and became a National Park in 1962. The restaurant at the Painted Desert Visitor Center is open from 8:00 am to 3:00 pm MST.